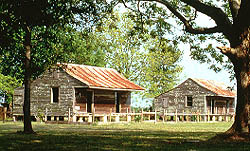 Situated on River Road between Baton Rouge and New Orleans, the Laura Plantation complex is located just upriver from the west bank community of Vacherie. The plantation is significant for its raised Creole plantation "big house" and its rare collection of outbuildings, including six slave quarters, that illustrate the development of a sugar cane plantation from the antebellum period well into the 20th century. The land on which Laura plantation stands was originally owned by André Neau, who obtained it through a French royal land grant in 1755. In the late 1700s, the plantation became the property of the Dupare family and was divided between two family members in 1876. The house continued in the hands of Dupare heirs until 1891, when Dupare descendant Laura Locoul sold the property to A. Florian Waguespack. A condition of the sale was that the plantation and house continue to be called "Laura". Constructed c.1820, the main house at Laura has a raised brick basement story and a briquette-entre-poteaux (brick between posts) upper floor. The house is special because of its Federal style interior woodwork and Norman roof truss. In Louisiana, far more Creole houses with Greek Revival woodwork have survived than have those showing Federal influence. Few examples of the Norman roof truss construction technique survive, and they are usually found in very early Creole houses. Although Creole residences once dominated the rural landscape of central and southern Louisiana, today perhaps only 300 to 400 examples of these buildings remain standing outside New Orleans. Of these, the majority are small or moderately sized one-story houses, while only approximately 30, including the main house Laura, are members of the distinct group of substantial raised plantation houses regarded as the apex of the Creole style. Little attention has been given to preserving the coterie of dependencies that were the "workhorses" of cotton and sugar production on Louisiana plantations. 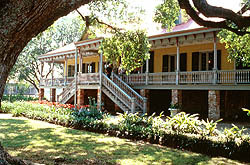 Historically the state was dotted with hundreds of plantation complexes such as Laura, but today they are rare survivors. One of about 15 surviving plantation complexes in the state, Laura might be compared to Whitney or Evergreen plantations in St. John the Baptist Parish. Thus, it is a very important visual reminder of the large agricultural enterprise common in antebellum and post-war Louisiana. Laura Plantation is located on River Road midway between Baton Rouge and New Orleans. The home is open for tours daily, except for Creole holidays (New Year's, Mardi Gras, Easter, Thanksgiving, and Christmas). The first tour is at 10:00am, the last at 4:00pm. Gates close at 5:00pm. There is a fee for admission and groups are encouraged to call ahead. Call 225-265-7690 or visit the website for more information.